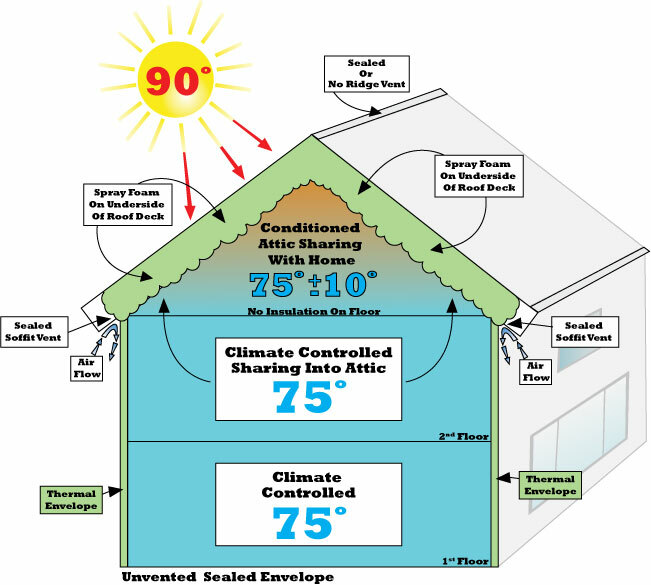 The “traditional envelope” diagram is showing a ventilated home with insulation on the attic floor. The second floor of the house is having a difficult time competing with the attic in extreme temperatures making it much warmer than the first floor. The thermal envelope on the floor is typically made of a non-air sealing product and simply is not strong enough to stop the air from the attic from infiltrating the house. This causes significant discomfort and unfair electric bills. If the floor is insulated below the joists, then it is not done to PA codes and you are likely heating and cooling your neighborhood out of the roof. If it is done to code(R-38) then you are eliminating any chance at using your attic for storage since it will exceed the joists by 8″-10″. 2. “The “sealed envelope” diagram is showing the thermal envelope being moved from the attic floor to the outer most perimeter of the house. Spray foam is being applied to the roof deck while sealing all areas that allow air from outside into the attic. 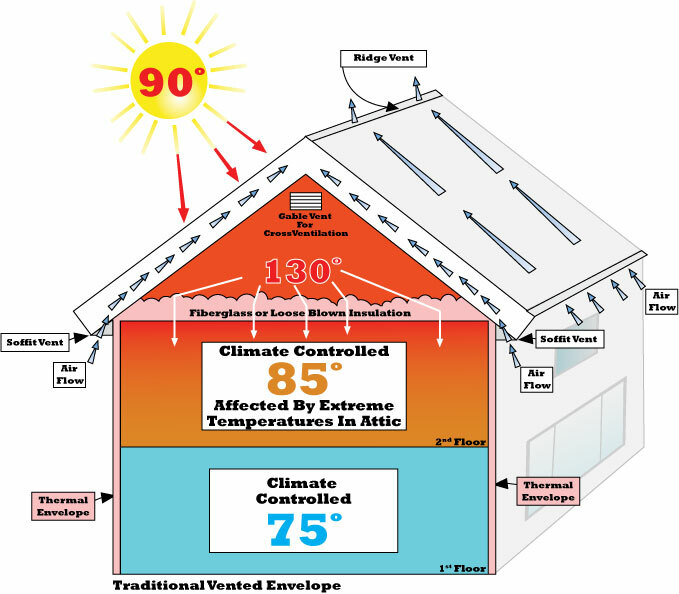 The attic is now a semi-conditioned space that shares much lower temps with your house rather than the outside. This will cut utility bills and will distribute the temperature in the house much more evenly making the second floor much more comfortable. The attic can now be used for storage and safely host HVAC equipment as well.